DJ Tonkatsu Agetaro is a special anime if you like the world of DJing and hiphop club music. It is short format with each episode running for about 10 minutes long. The art and animation is lacking, but that was easy to overlook for me because I went into this show without expecting much. Each episode explores an aspect of DJing. My favorite episode is the Chill Out one. I'm a simple guy. I like tonkatsu, I see a show about tonkatsu, I watch the whole series in one day. In all seriousness, it's great to see more short form anime receiving lots of love and attention they deserve. If you enjoyed the wacky insanity and fast paced comedy of Space Patrol Luluco and you need something to cool off from your Trigger induced space trip, Tonkatsu DJ Agetaro might be just for you. Although the show does not have the high energy of Luluco, Tonkatsu DJ has its own charm that is strangely appealing. Understandably, you might be turned off by Tonkatsu DJ's art style, being rather crude and more along the lines of an Adult Swim eye catch. While I adore the show's art style, I did find it slightly unappealing at times. However, a lot of the show's humor is based on the silly and exaggerated appearances of the characters. Our protagonist, Agetaro Katsumata, has some of most entertaining reactions to the fundamentals of being a DJ master and a pork cutlet chef. Some of the show's best bits are Agetaro's revelations on how becoming a DJ and making pork cutlet correlate. Who would have thought chopping cabbage and scratching records had the same BPM?! As you would expect, Tonkatsu DJ doesn't have an intriguing and compelling story, centering primarily around Agetaro's journey in being the amazing, ultimate Tonkatsu DJ! Yet, the show's various goofy situations and colorful, comedic supporting cast makes it a rather unusually fun ride. If the absence of more Luluco makes you feel empty inside, perhaps Tonkatsu DJ can fill in the void with some fresh, hot tunes and tonkatsu. While the production quality of Tonkatsu DJ can't really compare with the former, it's a surprisingly pleasant and entertaining watch. And at times, it can feel rather touching. I'm not ashamed to admit one of the tracks in Tonkatsu DJ has become my ringtone. Some songs are often reused, but they're undeniably pretty darn catchy, especially Rainy Lenny. If you've got some time to spare and you're looking for a fun time, give Tonkatsu DJ Agetaro a shot. At the very least, the OST should get your attention, plus, the conclusion is pretty satisfying and rather heartwarming. Cooking and DJing in the same anime? Sign me up! First of all, I love the art direction for this show, the style fit perfectly with the feel of the show. Tonkatsu DJ covers different parts of DJing instead of just giving it a flashy EDM gloss over in a animated short format who's episode length is on point. P.S. While the main theme is great (along with the rest of the soundtrack), I absolutely love "Rainy Lenny". Also, not sure if DJ Big Master Fry is supposed to be just a pun or also a reference to Frankie Knuckles. - Lighthearted as they come, the story of TDJA has no real conflict apart from a child learning how to DJ. - a forgotten romance that is onesided and disregarded. - Pacing is atrocious, while I understand that the series has limited time and wants to get to the meat of the story, the pacing and timeline of the show makes little sense. Tonkatsu DJ is one of the best short form style anime to come out recently. It is able to have a complete story in 9 minutes without feeling random or disjointed. Also, the simple art style is really unique and charming. 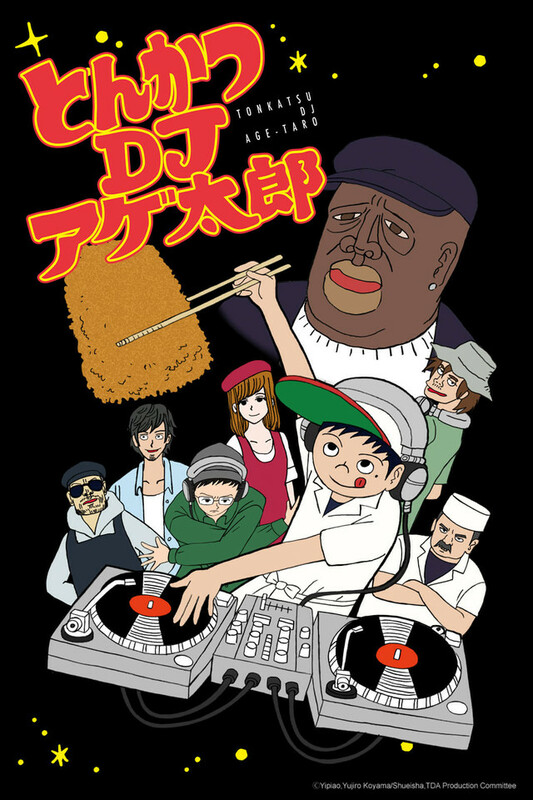 Our protagonist, the Tonkatsu DJ, represents what hard work and application of life skills can do for you. Also, most of the characters introduced are wonderful and unique. Without a doubt, I would recommend everyone to give it a shot (The normal 3 episode count) and see if you like it. Wait, what? A DJ Anime? Of all the anime I've watched, this is definitely something completely different and new. I started watching it just for a filler, but it was interesting and I wanted to see how it progressed and grew. I thoroughly enjoyed it, even the art style! I think anyone who enjoys music or DJs should check it out. Its a bit different, but give it a chance! You will especially enjoy it. Everytime I watch it I cant help but get hungry. The music, the vibe, the katsu. Really surprised me, I was just looking for a new show to watch and bam! Wow, I guess i need to write another 29 o wait 18 more now its less characters for the review. Watch the show. Its funny and enjoyable.